Also known as “Casas Colgadas“, The Hanging Houses are the most popular attractions of Cuenca, Spain. The history and exact origin of The Hanging Houses is unclear. Some believe they are of Muslim origin, while others say they are Medieval. 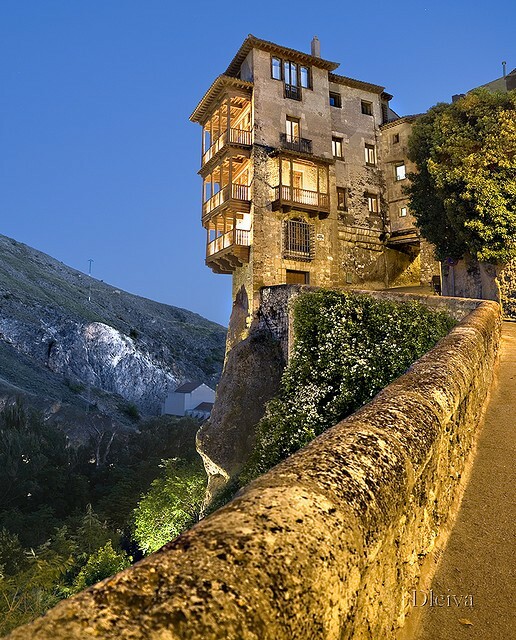 Centuries ago, this kind of building was frequently seen throughout Cuenca, but nowadays only three “Casas Colgadas” remain, built in a cliff, above Huecar Gorge. La Casa de la Sirena (House of the Mermaid) and the two Casas de Rey (Houses of Kings) were built somewhere between the 13th and 15th centuries and have been renovated in the 20th century. Now the houses host the Museum of Abstract Arts and a restaurant, but they remain the most photographed landmarks in Cuenca.